Browse: Home / alias – modular tool for finding backdoor for Sat. modular tool for finding backdoor for Sat (ALIAS) – a customizable scalable tool that can employ incremental state-of-the-art SAT solvers and black-box optimization heuristics to search for backdoors for hard SAT instances. The found backdoor is then used to solve the corresponding instance by the same incremental solver. 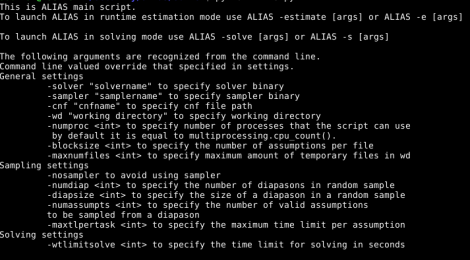 Thereby, ALIAS can be viewed as a tool for constructing backdoor-based divide-and-conquer parallel SAT solvers. + genipainterval – program that, given a CNF formula and a set of assumptions, processes the latter using some incremental way. To build it one needs the IPASIR API. ← linkedin2username – OSINT Tool for Generate username lists from companies on LinkedIn.